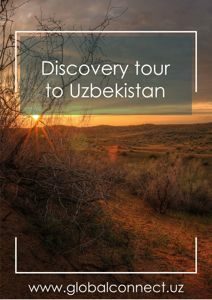 Adventure Tour to Uzbekistan: Explore ancient cities of Uzbekistan and magnificent landscapes of the Ustyurt Plateau and the Aral Sea. Watch the process of producing ceramics in Gijduvan. Explore the ancient sights of Nurata city. 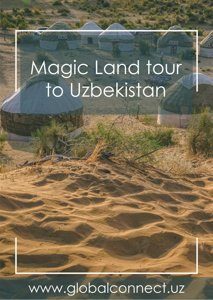 Discover Kyzilkum desert. Stay in the desert Yurt camp and ride on the camels. Hike in the Chimgan mountains. Arrive in Tashkent. 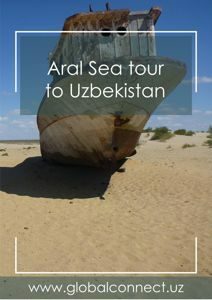 GLOBAL CONNECT driver will meet you at the Tashkent International Airport and transfer you to the Domestic Airport. 16:45 Arrive in Nukus. Transfer to the hotel. Check in. Free time. Overnight at the hotel. 17:30 Arrive in Nukus. Overnight at the hotel. 09:00 Visit Savitsky Art Museum. On the way to Khiva visit Chilpik Kala, Jampik Kala and Badai Tugai. 13:00 Arrive in Khiva. Leave your luggage in the hotel (check in is at 14:00) and start your walking sightseeing tour in ancient Khiva. 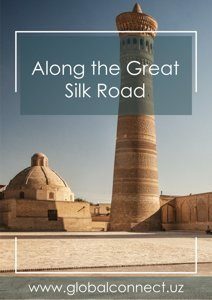 Explore the walled inner town of the city of Khiva - Itchan Kala. Visit Mukhammad Aminkhan Madrasah, Mukhammad Rahimkhan Madrasah, Kalta-Minor, Kunya-Ark, Juma Mosque, Tash-Khovli Palace, Minaret of Islam-Khoja, Pakhlavan Makhmud Mausoleum. Free time. Overnight at the hotel. 10:00 Visit Ayazkala, Tuprakkala and Kyzylkala. Drive back to Khiva. Free time. Overnight at the hotel. 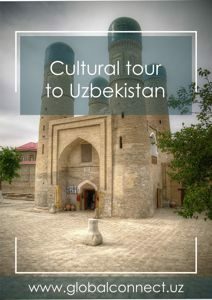 10:00 Start walking sightseeing tour in Bukhara. 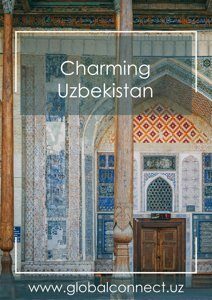 Visit Lyabi-Khauz Complex, Magoki-Attori Mosque, Chor-Minor Madrasah, Trade domes, Kalyan Minaret, Kalyan Mosque and Miri-Arab Madrasah, Ulugbek and Abdulazizkhan madrasahs, Ark Fortress, Bolo-Khauz Mosque, Chashma-Ayub and Ismail Samani mausoleums. Dinner (Recommended to have a dinner at Nodir Devonbegi Madrasah Restaurant where you can enjoy Traditional Dance Show). Overnight at the hotel. 09:00 Continue sightseeing. Countryside sightseeing. Visit summer residence of Bukhara’s last emir - Sitorai Mokhi-Khosa, Bakhouddin Naqshbandi Mausoleum and Chor-Bakr Necropolis. Lunch. Free time. Overnight at the hotel. 13:00 Arrive in Nurata. After lunch visit the complex Chashma Spring. Go up to the hills to visit the remains of the fortress of Alexander the Great. 14:00 Check in. Free time. 11:00 Arrive in Shakhrisabz. Visit Mausoleum of Jakhongir in Dor-us Saodat Memorial Complex, remains of Ak Saray Palace, Kok Gumbaz Mosque. Lunch. 10:30 Arrive in Charvak. Walking in the mountains. Take a cableway ride. Transfer to the shore of the Charvak Reservoir. Drive to Chinara’s restaurant to have lunch under the shade of four ancient giant plane tree. On the territory of the restaurant, there are unique petroglyphs and rock carvings made by prehistoric people. Transfer back to the hotel in Tashkent. Free time. Overnight at the hotel.